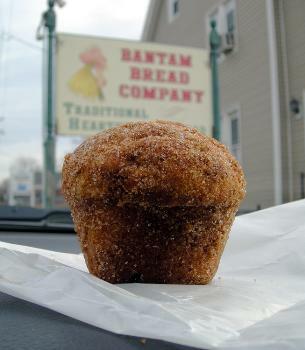 CTMQ > Food & Drink > Food Lists & Trails > *Dirt Bombs at Bantam Bread Co. I could have gone with “Bantam Bread Company is the Bomb” or, more embarrassingly, “Da Bomb” for my title. I opted to go a few shades hipper with an Outkast reference, perhaps further alienating the over-50 set who read this blog far more than the under 30 punks. Oh well. 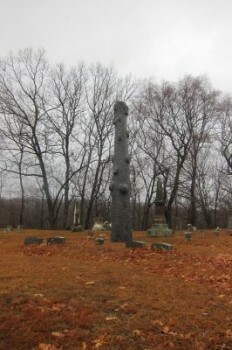 Who cares, this post is about one of the most delicious things Connecticut residents can ingest, not how cool I am. Although, I’d argue, you’re only a cool Nutmegger if you’ve made the effort to get out to Bantam to eat a dirt bomb. Not that it’s all that much of an effort. Everyone finds themselves in Litchfield’s town center at some point, right? Just keep heading west past White Memorial and out towards Morris and Mt. Tom – and keep an eye out on the left. It’s easy to miss when traveling west. Roadfood is an excellent food blog and the Sterns have just this week churned out another book, 500 Things To Eat Before It’s Too Late. There are 59 Connecticut entries and I guess I’ll just have to sample them all. It seems rather hot-dog heavy, with about 10 different entries, but everything else looks great. Bonus: Hoang will happily be along for most of this ride. Sorry, I’ve gotten a bit off track. 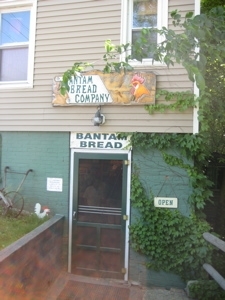 We stopped by the Bantam Bread Company as it was only a mile “out of our way,” though I’ll be going much further in the future. It’s a teensy tiny place, with a usually full parking lot. The owner’s vehicle. I think. 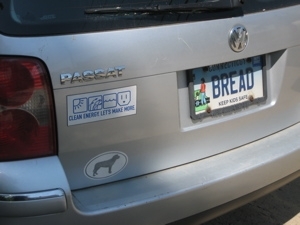 I love good bread. In fact, I would put it in my top 3 favorite foods. I’ve been to rural France and let me tell you – there’s a reason those people just eat bread for a meal sometimes. It’s that good. But what of these dirt bombs? [A dirt bomb] is a muffin that is vaguely spherical in shape, its exterior blanketed with a thick coat of cinnamon sugar that might be considered a confectionary version of dirt. In the world of muffins it is THE bomb, as in THE BEST, so much better than a normal muffin, and in some ways so unlike one, that it almost seems wrong to label it as such. Its mouthfeel is more like that of a doughnut; slightly crisp exterior skin enveloping nutmeg-tinged tenderness that is as velvety as a whipped cream pound cake. Its sumptuous character is owed to the fact that before it gets rolled in cinnamon sugar, the dirt bomb is fully immersed in melted butter. The butter seeps in a creates a halo of inexpressible opulence that separates the creamy interior from the golden, cinnamon-crisp skin. They are a buck each and worth much more. [2013: I got my wish… 33% more!] These things are simply incredible. 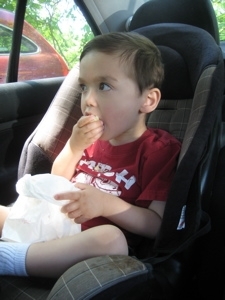 Damian plowed through his and spent the rest of our day picking crumbs off his carseat and eating them. Hoang’s disappeared before I could take a picture of her enjoying it (she looks much better than I do eating, trust me). I wanted to go back for more once I was done mine. Two things to note: They aren’t allowed to serve coffee due to some wacky Litchfield/Bantam ordinance so bring your own. And you can get the recipe for these things from the Sterns’ new book. Somehow I don’t think you’ll make them as well though. [2013: Phew. Like I said, that was a bit of a slog to read. I hate going back and reading old pages. But I’m sort of doing a series of pages this week about stuff around the BBC so I couldn’t just leave this page alone. Like I said, I’ve probably picked up dirt bombs at least 10 more times since this initial visit. I’ve done a lot of great hikes just west of the bakery and love to bring the treats home to my starving and desparately missing Papa family. 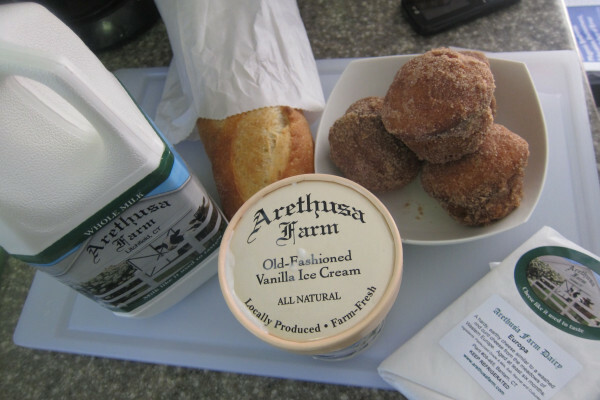 Perhaps the most important development is the opening on Arethusa Farm Dairy almost directly across the street. (My page on their milk and ice cream) These two establishments provide one of the best 1-2 food punches in the state, as you can see from my “Bantam Bounty” that I picked up after some hiking out in Washington at the Steep Rock Preserves.